iMovR’s new Freedom Standing Desk Line takes cheaply-made imports to task, combining American-made quality with an impressively low price point. For those over 5’11”, upgrading to the XT base (+$75) will deliver extra height range. 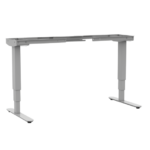 The iMovR Freedom standing desk line shines by offering what, up to this point, has been missing on the market – a quality American-made option priced competitively with popular standing desks built on commodity imported bases. If you’re trying to find a standalone base frame for building your DIY standing desks, there are certainly a lot of choices in the market, as we compiled in our roundup of Standing Desk Base Reviews. 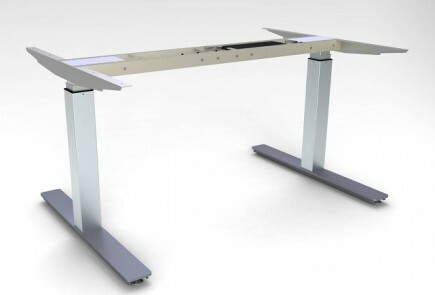 The Freedom standing desk base is iMovR's answer to low-cost imports, leveraging design ingenuity and a great deal of investment in robotic manufacturing to combat the labor cost advantages China has. Now for only very slightly more than an import, you can get an American-made product with similar performance but built to last much longer, and backed by a 10-year warranty and domestic customer support. For the very short as well as the very tall, and for treadmill desk users who are 5”+ taller when walking at their desk, the Freedom covers all bases. There are actually two versions of the Freedom base. The standard model is a single-stage (two leg segment) base with a height range of 27" to 45" (460 mm). The "XT" model is a dual-stage (three leg segment) base that has a 22.5" to 48" (660 mm) height range. The latter is ANSI/BIFMA certified so it can go into any government or large enterprise office. Like most single-stage bases, if you’re under 5’11” the standard model will technically work for you. You’ll want to go with the dual-stage XT model if you’re taller but still under 6’2”. If you’re taller than 6’2” tall, the Freedom is one of only a few bases on the market that’ll work really well for you, by adding the optional 6” leg extension kit (iMovR offers this on all their made-in-America electric desks). That’ll extend the Freedom base’s user height range up to a 6’8” NBA player. If you’re taller than 6’8, you can also add caster wheels to hack in another 2.5" of height. As we explain in our primer on Why Some Desks are Shakier than Others, it’s always a good idea to pretend you’re a few inches taller than you actually are when shopping for an electric standing desk base, to ensure stability at the top end of the height range. Regardless of brand, any standing desk will start getting shakier as the overlapping areas at the end of the telescoping tubes get smaller. It’s simple physics. That said, the wider and heavier the desktop, the more you will want to hedge your bet by upgrading to the XT or adding the 6” extension. Rather than cut corners on metal gauge, motor quality or electronic features, the Freedom's ingenious design removes the plastic end caps that keep the tube segments from coming apart - parts that can wear down over time and leave you with a wobblier desk (and keep in mind these parts are not serviceable). Instead, the legs on the Freedom base have distinctive crimped corners on their down tubes. Like cars and all other things mechanical, no base will last forever. But the Freedom's PerfectPaint™ coating on its legs are not only more resistant to scratches than other powder coat paint jobs, but reduce friction as well, again lengthening the useful life of key components. 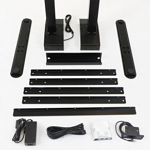 If you’re looking for a great compromise in performance versus cost, the Freedom base probably represents the best consumer value of any DIY standing desk base we’ve reviewed. Sure, you could go more upscale with iMovR’s state-of-the-art Lander desk base or Vigor “heavy lifter,” but unless you need that kind of lifting power, transit speed, fancy Bluetooth hand controller or 7’ width capability, the Freedom has everything you need to build a refined DIY standing desk. The digital controller is simplified. It has only two buttons—Up and Down—but these also store your preferred sitting and standing height. Another clever cost reduction (and size reduction of the svelte hand controller) by eliminating the extra buttons necessary for programming height presets on other models. 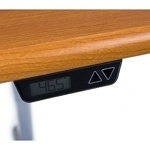 The Freedom's LCD controller stores two height presets—so you can easily transition to standing or sitting. The Freedom comes in black, white, and silver paint schemes. Transit speed is 1.5 ips, and the weight lift capacity is 265 lbs. The Freedom bases can support either 24" or 30" deep desktops, and can accommodate desktop widths of 48" to 72". Its 35v power supply has an impressively low standby power consumption rate of less than one-tenth of a watt. iMovR uses the versatile Freedom base in their Energize and Cascade standing desks as well as their corner standing desks, offering over 5,400 permutations of base size and color, and desktop shape, size and color, all off a single versatile base platform. For more information on DIY standing desk bases, check out this comprehensive guide. To stay abreast of new product information across the spectrum of office fitness, be sure to subscribe to our newsletter. Rated Lifting Capacity 265 lbs. The Freedom’s LCD controller stores two height presets. Can I Install a Keyboard Tray on my Standing Desk?